God shows Job the kingdom of the wild, where God’s Wisdom and nurture are ever present. Online resource Will you come back with me to the birth of the Earth / Song of the Wild (Habel) Excellent words of wonder. PDF. *HiOS022 Creator God, we give you thanks (Gibson) Fun song for kids and adults. The tune moves quickly and has lots of words, but it's quite fun. "Creator God we give you thanks for those who live in nest or tank, in basket, kennel, bowl or shed, on sofas, perches, straw for bed." CH143 Who put the colours in the rainbow? (Booth) A bit tacky, but could be fun for kids or a kids' choir. Good for kids. God nurtures and sustains all creatures of the wild and joins with them and us in celebration. *AoV1-019 / CH151 / GA397 / G(II)340 / GC493 / GC(II)498 / G(3)575 / W&R39 All You Works of God (Haugen) Joyful call, response and chorus. This will take a little work to get your congregation into the rhythm of how this song works, but I really think it would be worth it. Lead sheet. Sound sample. Good for kids. NCH032 / UMH122 / VU229 / HPP32 / GtG022 / PH272 / CP414 / W&R29 / Cha070 God of the sparrow God of the whale (Vajda) This is a beautiful song, but for some reason it sounds kind of odd with an Australian accent. Works especially well this week with the lyric: “God of the rainbow, God of the cross, God of the empty grave”. Lyrics. 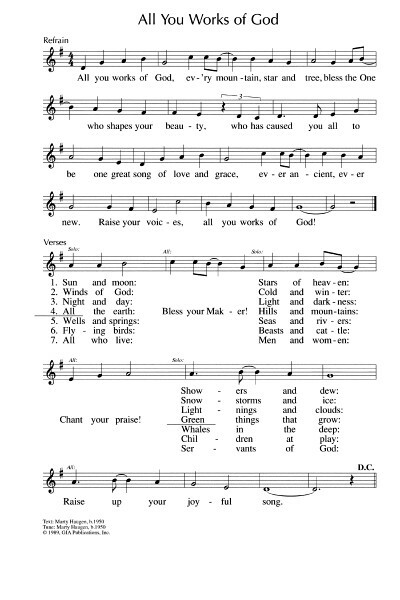 CH227 / PfAS065A The earth is yours O God (Saward) A simple hymn paraphrase of Psalm 65, that also fits this Psalm. To the tune ROSSLEIGH. TiS 671 / AoV2-121 Made in God's Likeness (Lewis/Spence) "Called to create a new world for the Lord". Excellent images of rainforest birds praising God. This is one of my very favourite songs. It is not difficult if you have a good musician at the helm. If it is new to your congregation, they will be able to join in on the verses by the time you get to the 3rd one. The change in tone with the verse really lifts this song. Lyrics (search for "Made in"). NCH34 / Iona (SL) / CH138 / SgTJ1065 Nourished by the rainfall the earth can come alive / Flowers of every colour now raise their heads in pride / As the rain is falling / Alabanza (Badillo) Complex words, but a simple repetitive tune. Inclusive, earthy. Great for a temperate Springtime. There are quite a few different English translations of this Puerto Rican song. I particularly like the translation in Church Hymnary / Hymns of Glory Songs of Praise. midi sample. The Wisdom of God evident in creation. God provides for all leading us to live in harmony and not be stressed about possessions and power. NCH590 / CH621 Spirit of Jesus, if I love my neighbour. Challenging words of offering help from a position of privilege and seeking to be set free from the entrapment of possessions “If I am hugging safety or possessions, uncurl my spirit as your love prevails, to join my neighbours, work for liberation, and find my freedom at the mark of nails”. 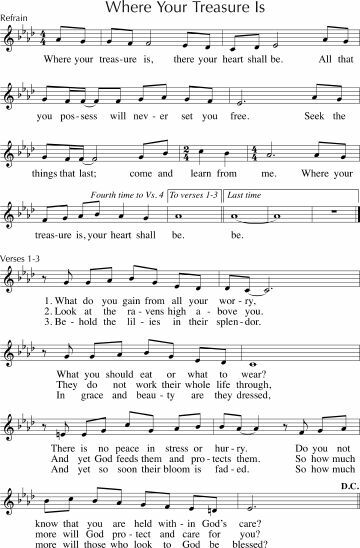 Could also be sung to the tune PERFECT LOVE if your congregation would have trouble with the newer tune, in which case it's New words to old tunes. *Taizé / TiS 739 / AoV2-041 / ATOK 404 / VU290 / GA269 / SFFS 2054 / GtG820 / G(II)451 / GC639 / GC(II)626 / G(3)733 / CP568 / W&R421 / URW388 / Lau947 Nothing Can Trouble / Nada te turbe (Berthier) Excellent and quite well known Taizé chant. Spanish lyrics are not too hard for non-Spanish speakers. Sometimes this song seems impossibly hopeful (just quietly)... Sheet music, sound samples, lyrics and translations. Good for kids. Do you have some ideas? Join the conversation and add them below!